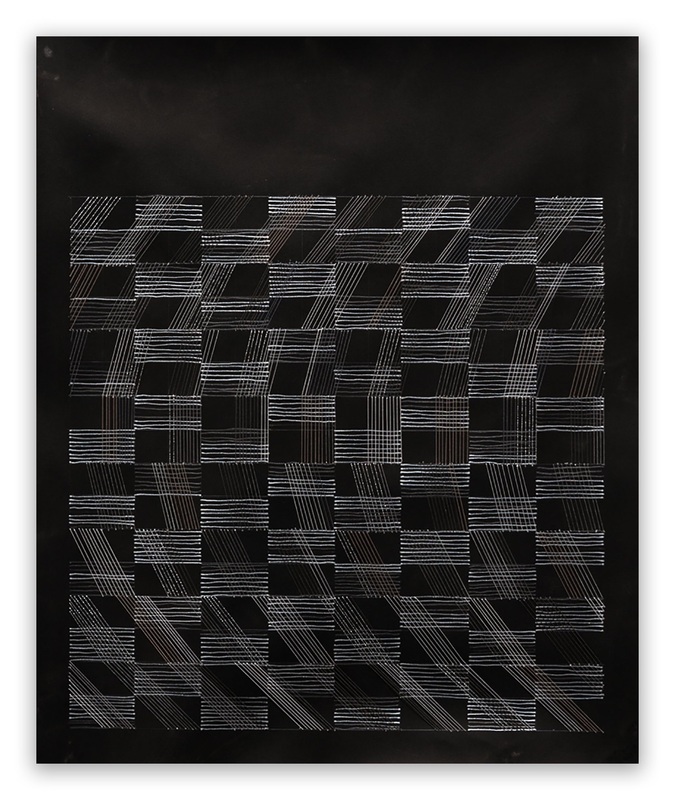 In 2007 Audrey Stone began a series of work using a combination of thread, ink and graphite within a grid format to explore what defines a line. At first glance, the lines appear identical with little or no variation from each other. Upon closer inspection it becomes clear that some lines are sewn into the page and others are drawn in ink or graphite. Combining the two materials to create similar effects of line was a way to also think about two separate but overlapping languages; craft and fine art. The thread line has dimension and a sculptural element to it, casting shadows and revealing space between it and the paper while the drawn line, depending on the material used, ink or pencil, appears to either rest on top of the paper surface or to sink into it. Studying, inspecting and comparing the lines becomes almost inevitable as the drawn line can be seen as a representation of the 3 dimensional thread line and visa-versa. As the work progressed (as is the case in the above work) a breakdown within the grids occurred as Stone strayed from the use of constant parallel lines of earlier drawings and began using angles and at times more random patterns. The flow of information and line within each drawing may expand, contract, repeat or multiply depending on the system involved in the particular work. The systems are not perfect, there are hits and misses of intent along the way as well as a desire to let the imperfect unions of line remain. While making these works, the artist's eye/hand coordination is challenged: how straight can a drawn line be? Will the pen or pencil make contact with the plum line of the thread? The drawn line reveals the natural instability of the hand, a human element, something Stone has always aimed to maintain in her work. Edited by Robin Kahn; Published by Creative Time SOS Intl. Audrey Stone is an American abstract artist. Her work explores color, line, materiality and process across multiple mediums and surfaces. She was born in New York City, and currently lives and works in Brooklyn. Audrey Stone studied at Pratt Institute and the Nova Scotia College of Art and Design, and received her BFA from Pratt Institute in Brooklyn, NY, and her MFA from Hunter College in New York, NY. Over the course of her career, Stone has worked in multiple mediums, including site-specific installation, painting, drawing , sculpture and mixed media. Her works unfold on an intimate scale. When painting, she works on raw canvas. She layers a single color each day, allowing it to dry completely before addressing the next layer. The first layer becomes one with the raw surface, adopting the textural qualities of the material. Gradually as the layers build up the rawness is replaced by new qualities that are simpler to the eye but more complex in their composition. Many of her works also incorporate a sewn element, adding hand woven lines of thread, string or floss to the surface. 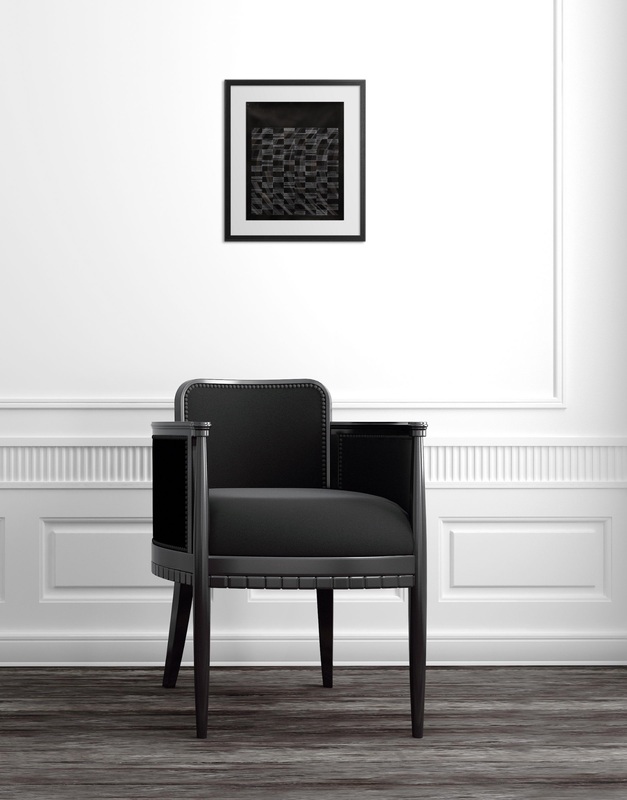 The sewn lines take on a sculptural presence. While formulating a design they simultaneously call attention to craft, respecting the importance of precision and tradition in contemporary abstract image making. As images, the works of Audrey Stone confidently express color , pattern and line, while as objects they reveal something far more personal through their presence. The meanings inherent in her materials and her processes, such as the rawness of her surfaces, the flexibility of her thread, and the imperfections of her painted or drawn lines, all serve as inspiration to Stone. Only through coaxing do her works come into being. A relationship built on intimacy and intricacy develops as they manifest. Stone is also inspired by the secondary meanings present in her materials: for example that thread can be decorative and also restorative, integral and also ornamental, or that color relationships can evoke archetypal reactions while also inviting personal reflections. All of these inspirations speak to the most important element of her work: its humanity. Audrey Stone has been exhibiting her work in group and solo exhibition since 1987. She has exhibited throughout the United States, as well as in Austria, Great Britain, Japan, France, Bulgaria and the Czech Republic. Works by Audrey Stone are included in several private and institutional collections, including those of Fidelity Investments and the Amateras Foundation in Sophia, Bulgaria.